In life we have choices to do many things and most of us know are taught to share and to give. We share toys with siblings and with friends, most of us share hand me down clothes, which teaches us how to give and take. As we grow older we are asked to give to charities by donating money, goods or time. Time by way of volunteering is incredibly valuable, by being taught to give we are taught respect and self worth. I was invited to the Big Lunch 5 years back by a dear friend who is a writer for the magazine "the big issue". so we went, it was fantastic, in the Adelaide Central markets, food donated by the stall holders and prepared by the head Chefs at the Adelaide Hilton Hotel. Wines donated by a local South Australian Winery , Yalumba, splitrock waters, Mountain fresh juice, Vale beers, HeyDayButter and Lobe cider. fantastic. My husband the farmer, said about the meat surely we can do better and from that day onwards we have. We donate either our grass-fed beef or lamb to feed 300 people so that all monies go directly to support the homeless and places women in distress in jobs. This year we did paddock fed chicken, lamb and invited a girlfriend to donate eartheggs to the dessert. All local Upper South east produce, delivered and prepared by well known chefs. 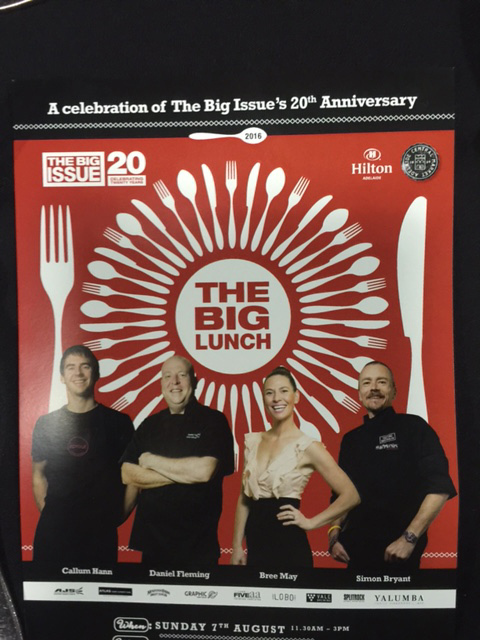 This year we were joined by 460 guests 40 of them ours and I was surprised to hear that not many people had heard about The Big Issue. Where half the proceeds go to the seller of the magazine and it helps to change their life. Nothing tastes as fresh as home grown, no hormones, antibiotics, prepared and given with love to help others who need it. How do you find your happiness? is it sitting at the table sharing a meal like we did? If you see the Big Issue sellers - buy the magazine it has great articles and know you're giving to someone who is doing the best for themselves that they can .